Creating killer content for your blog simply isn’t enough these days. 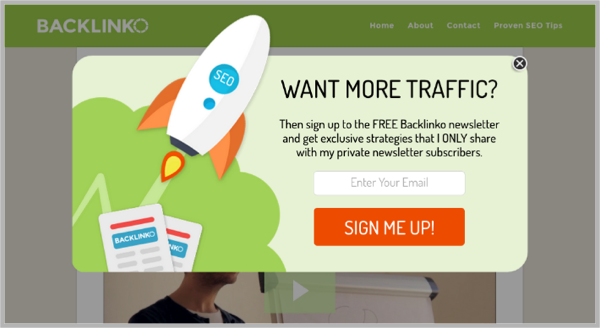 You need to pull people to your site and get them on your mailing list. The sad truth is that no matter how great your web content is, 70% of the people that visit your site for the first time are going to leave and never come back. This doesn’t necessarily mean you have bad content, it just means there is way too much information and options for them to choose from. The only way to get these visitors back to your site time and time again is through email marketing. However, while the concept of setting up a mailing list seems easy – it’s not going to work it’s magic without some extra effort trying to entice readers to give up their email address. This is where popup calls-to-action come in. If you regularly read the top marketers’ blogs, then you will no doubt have a collection of popups in your mind that ask you to join a mailing list right when you visit a site, or maybe even when you attempt to leave. While these popups may seem annoying, they are usually only shown once to a visitor every 15 days or so. What does matter is that these types of popup calls-to-action work extremely well and are adding millions of email addresses to blog mailing lists every single day! Even Jeff is implementing this same method on his blog. The reason they work so well is that they not only grab your attention, but when done properly, they add value to the user’s experience in the process. You can see Jeff’s popup in the screenshot below. It’s not just about creating a popup and throwing it on your site, it’s about catering to your audience and giving them value in the process. Everyone who visits this blog is probably interested in growing their blog and finding more success online. 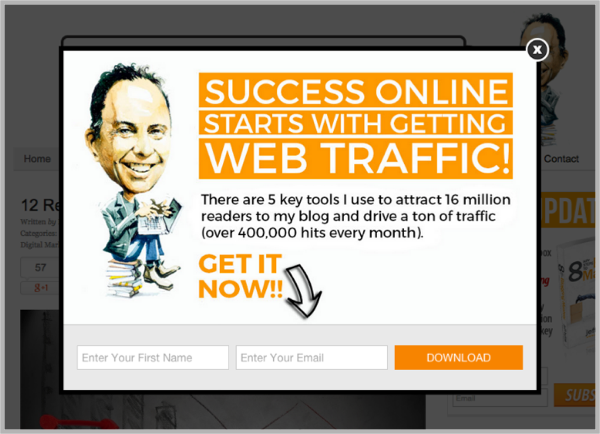 Jeff knows this all too well and created an excellent call to action to offer his “5 key tools that he uses to attract 16 million readers to his blog” to visitors of the site – how could you not enter your email to get that info!? 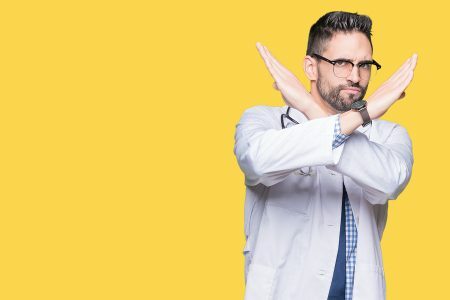 Going off these same principles, I wanted to inspire you to not only start running similar popup calls-to-action on your own site, but also to offer a rotation of different calls-to-action to see which convert best. To do so, I’m going to provide 10 unique and effective calls-to-action that are currently being used by other industry leading sites and getting people to jump onto their mailing lists! Below you will find a wide range of lightbox popup windows that are being used across well known blogger and marketing sites. Each of the selections below were hand picked and are highlighted for their unique calls-to-action. Originality screams for attention and it’s also appreciated by those who get to experience it. While there are many solutions to choose from when using lightbox and popup windows, the generic templates across them are all pretty much the same. This isn’t the case for Brian Dean of Backlinko, who has a completely customized look and feel to his light box. Not only is it original, it also blends right along with the branding of his site, which is based off clipart-like images that represent rocket ships and the continual rise of your SEO and rankings in the search results. If his on-site leadboxes don’t grab your attention and email address, there is a good chance his lightbox form will. If you truly know why people are coming to your site, then monetizing your audience and getting them to take action should be easy. This is definitely the case for Blogging.org and their how to start a blog tutorial, which is targeted towards anyone that wants to start a blog. 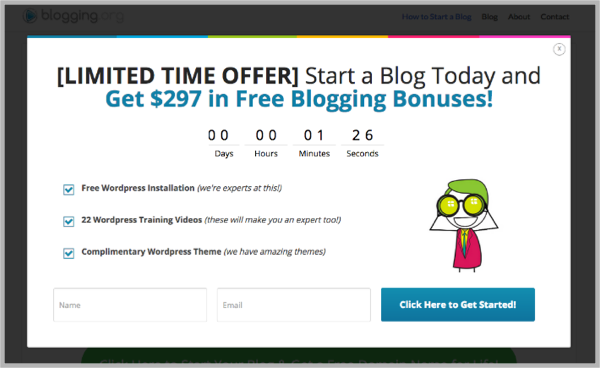 In addition to providing a full step-by-step tutorial on their site, they also utilize a popup window to provide a sense of urgency (with the count down clock), value ($297 in free bonuses) and guidance (training videos and course material) that cater to pretty much everyone who visits the site. No matter what the focus is for your blog, when you have an audience that all want the same thing, it’s easy to get them on your mailing list or to take action throughout your site. There are many different plugins and software solutions out there for how to setup popup calls-to-action on your site, and each of them have their own benefits over others. 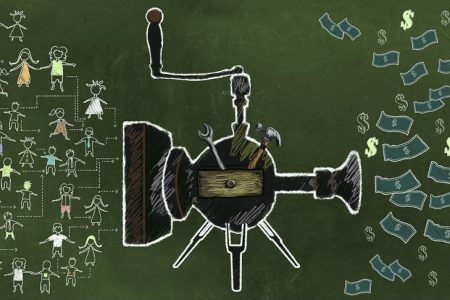 On the ShoeMoney blog, you will notice that his popup window is a bit different than others, in that it has moving parts and animation that really grabs your attention. As each piece of the popup loads individually and almost requires you to stay engaged, viewing each piece of content as it’s added in. This is another great way to grab the attention of your audience and get them to convert. The common theme across all lightbox popup windows is to simply grab the email address from the user, give them whatever it is you are promising and then get them added to your list. 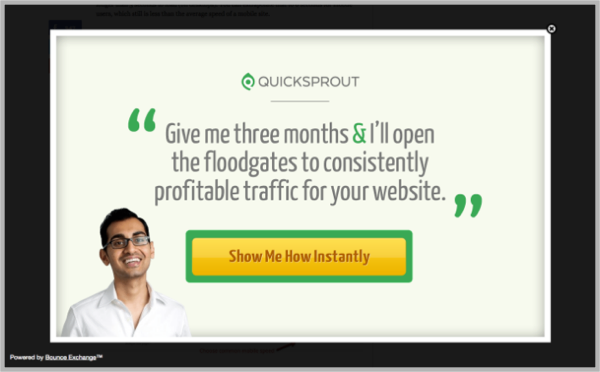 Neil Patel of QuickSprout takes a slightly different approach with his popup form. Before asking for your email, he has the popup below, which has a call to action of “Give me three months and I’ll open the floodgates to consistently profitable traffic for your web site”, and if you click the button, it will then proceed to another page where you can put in your URL for a quick site audit. Once the data is compiled, it then leads to a form asking for all of your contact info and marketing budget for a follow up contact. This is complex, but definitely a great way to weed out only high quality leads coming through your site. If you had the ability to make something that was extremely hard become extremely easy, would you do it? Of course you would, and this all goes back to the concept of “selling the dream” and how it applies to all of us – whether it’s through blogging, financial success or even weight loss. 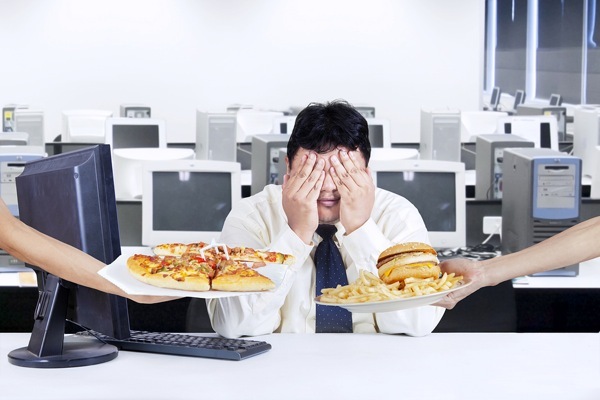 In the example of Health Ambition, it’s making the concept of healthy eating and weight loss a much easier concept to swallow than the thought of long hours at the gym and eating tasteless foods to shed some extra pounds. 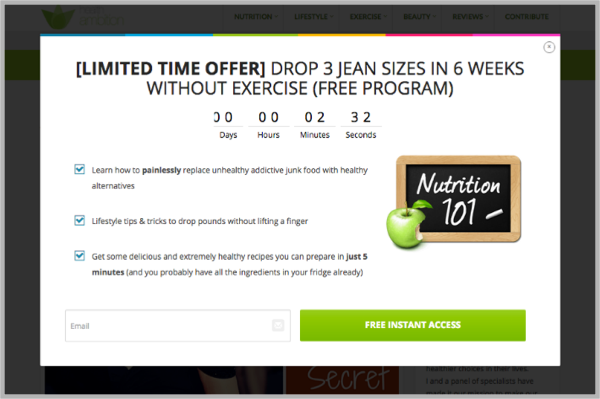 Through their lightbox, they’ve enabled multiple calls-to-action which include a count down clock, healthy eating tips and the ultimate call-to-action headline that says “Drop 3 Jean Sizes in 6 Weeks without Exercise”. Who wouldn’t want to sign up for that! Popup and lightbox subscription forms aren’t just being used on blogs, they are actually being used on some of the top sites across the internet… whether they be news, entertainment or even ecommerce focused. OptinMonster is one of the best selling lightbox WordPress plugin solutions out there (currently being used on this blog as well). Not only is OptinMonster being used across thousands of sites, they also use what they preach on their own sites as well. 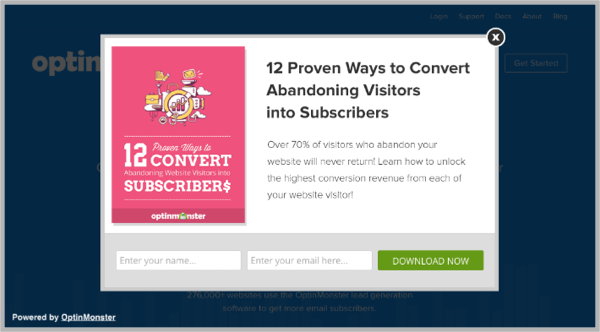 In the screenshot below you will see the title of their call to action is “12 Proven Ways to Convert Abandoning Visitors into Subscribers”, which is exactly what users are trying to accomplish when visitors are going to OptinMonster. By knowing your audience and giving them exactly what they want, it’s one of the best ways to not only get them on your mailing list, but also warm them up before the sale as well. Podcasting is huge and it’s growing in size daily. With so many people jumping into the world of podcasting, it’s not the easiest thing in the world to setup… which is why there are plenty of podcast training and tutorial sites out there as well. Many of them are great, but when you look at all of the text content that is out there, it can get quite overwhelming. 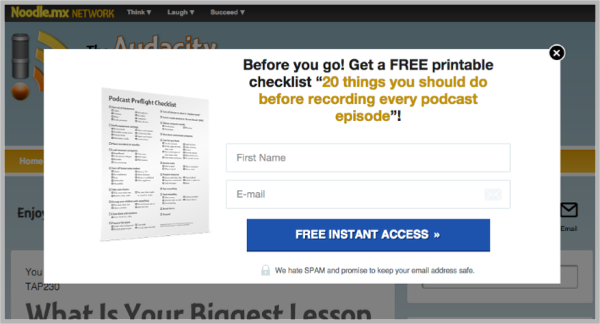 The Audacity to Podcast is one such site and they’ve created the perfect call to action for their audience, which is to download their “20 things you should do before recording every podcast episode” PDF cheat sheet. This is a great bonus to anyone visiting the site, because the last thing someone wants to download is another 100+ page ebook they will never get to read through. A cheat sheet or one page PDF is the perfect way to incentivize people to join your mailing list. When it comes to using lightboxes and lead gen forms to get users to enter their email address and subscribe to your list, there is often a lot of trickery going on. 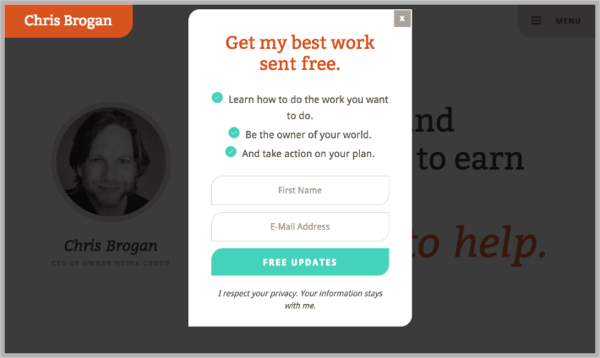 This isn’t the case for Chris Brogan, who has a dead simple call to action on his popup that simply says “Get my best work sent free”. 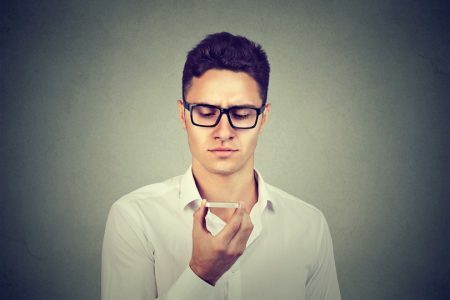 Now this concept is different for many reasons… the first being that he isn’t offering the promise of tripling your traffic over night or even offering any bonus download in the process. The other side to this is that nearly everyone who does fill out their information is genuinely interested in what Chris has to say. This means everyone on his list wants to be there, will probably remember when and why they signed up and also have a much higher value per subscriber. If someone was going to ask you a question in real life, there is a good chance you would be willing to answer it. The same holds true for when you are asked a question online, especially if it is in the form of a popup window that fades everything else out. Yaro Starak is currently using this method on his blog, which is targeted towards bloggers and helping them grow their business online. 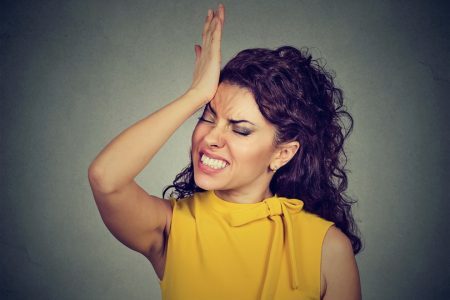 Yaro asks “What is the #1 reason why blogs fail?” – of course if you want the answer, you will need to put in your email address. 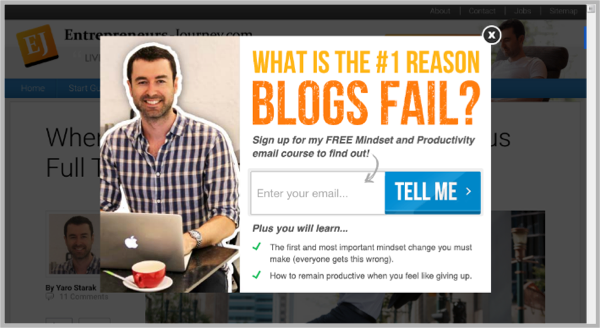 This method works extremely well, after all, no blogger wants their blog to fail. If you already have a successful blog, brand or business, you can probably consider yourself an expert in your space. 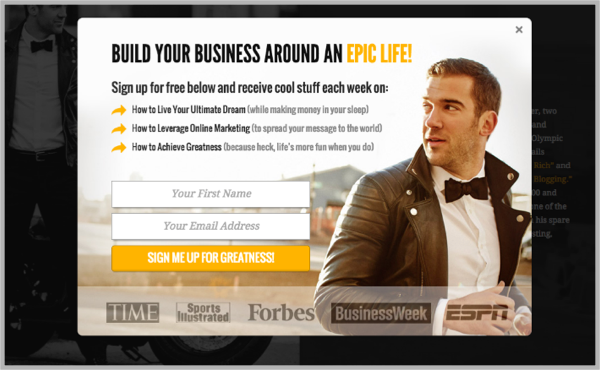 Lewis Howes was able to take this concept to a whole new level through his personal blog. 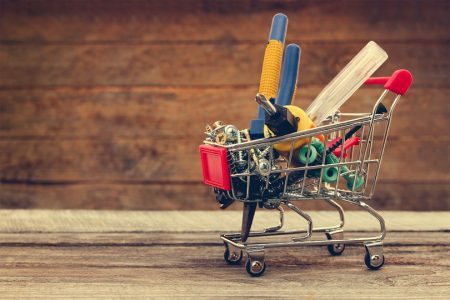 Let’s break down some of the key takeaways from Lewis’ popup call-to-action. First, he has a very high quality and professional photo of himself (which is also the theme throughout his whole site), he’s also showing his expertise by being featured in Time, Sports Illustrated, Forbes and other publications. Lastly, he’s using the same technique as Chris Brogan, in that he is simply offering the ability to join his list for future updates and not incentivizing the signup with a bonus gift. 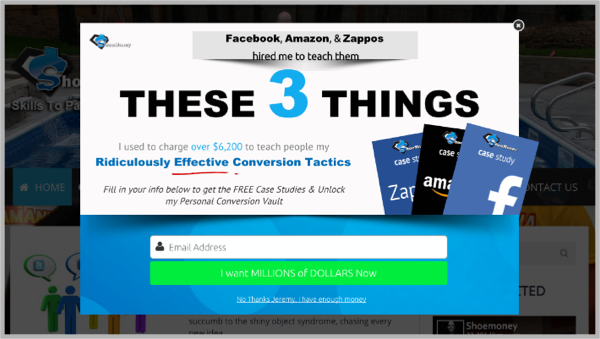 How to Create a Popup that Converts Like Crazy! Now that you’ve hopefully been inspired by the popup calls-to-action above and seeing how top blogging and marketing experts are getting their audience to aggressively jump onto their mailing lists, it’s time for you to do the same. Follow the quick three steps below to see higher volume and conversions for mailing list signups on your blog. The first step is to implement a lightbox popup if you haven’t already. After that, be sure to take the time to create a call-to-action that relates with your audience and provides value in the process. The last step is to run through the list again and see how you can improve your popup and call-to-action like others have for their sites. Once you have your lightbox popup live and traffic starts flowing through your site, you should be able to start seeing conversions right away. Also, be sure to split test different designs, images and calls-to-action for best results.